Millennium City “Gurgaon”, famous for its sprawling buildings, shopping malls, MNCs, etc., added another golden feather to its cap as the ultimate entertainment and leisure destination “Kingdom of Dreams” has opened its doors at the apex of the golden triangle of Jaipur, Agra and Delhi. This fabulous Kingdom brings to life a blend of India's art, culture, heritage, craft, cuisine and performing arts with the latest technological wizardry and sprawling across acres of land, is the magnificent palace showcasing the Indian culture. Kingdom of Dreams presents the Indian culture in a unique way through its venues like the Nautanki Mahal: an extravagant cinematic and theatrical musical; Culture Gully: an elaborate culture, arts, crafts and food boulevard; Showshaa Theatre: a drama marquee spotlighting Indian mythology productions, a mock wedding show and the great Indian talent circus; iifa Buzz: a glamorous Bollywood themed café. This is one destination that is capturing the imagination of the world. 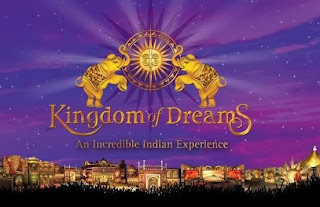 A Joint Venture of Wizcraft International Entertainment P. Ltd. and Apra Group of Companies, Kingdom of Dreams has joined hands with INLEAD to provide INLEAD students a pool of opportunities in hospitality and allied services sectors with one of the biggest entertainment extravaganzas to hit the town. The students at INLEAD are looking forward to the upcoming Corporate Connect Week to charm the officials at Kingdom of Dreams to get a chance at interning at the hub of innovative and creative thinking. Please contact our Counselors for an indepth discussion regarding our Programs. You can call them at +91 88005 92300-09.